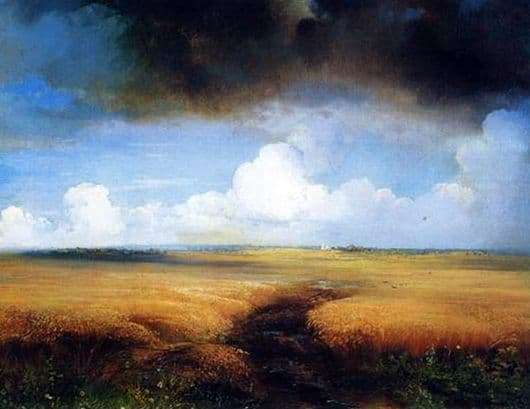 The well-known landscape painter Savrasov, on the eve of important changes in life, foreseeing and foreshadowing them, writes a rather difficult for perception picture – “Rye”, in which all heavy thoughts that stirred the artist during this period were reflected. The painting was created in 1881, significant for the artist by the fact that at this time his wife was leaving him, the artist was also fired and the artist rushes about in search of a new, something unusual and exciting. He writes “Rye” as it should be before the storm. The rye field froze in anticipation of a thunderstorm, in the foreground clouds hung, ready to spill hundreds of heavy drops. And in the distance everything is clean, but it is already awaiting the arrival of wind and rain. The rye field looks darker, the brighter the rye that grows on it, it leans under the wind, unable to oppose anything to it, while not wanting such submission. A heavy dark cloud similar to the life of an artist, who by this time also began to resemble this rye field, in anticipation of a thunderstorm. And it seems as if the wind will carry the rain past, but this is not so, the cloud hangs too low, the sun gradually disappears and a shadow creeps from the foreground of the picture to the horizon, absorbing more and more earth every second, leaving behind only the purple glow of ripe rye. There is a white church in the distance, as a symbol of protection from the approaching darkness, it is lit by the disappearing sun and is therefore clearly visible from afar. White clouds spread across the sky from this church, which seemed ready to protect the earth from the oncoming darkness, but they are powerless, the cloud is too black. For people who are not afraid of the vicissitudes of nature, the picture causes wild delight, which comes at the moment of waiting for a real thunderstorm, while the rest are filled with gloomy despondency, as if feeling for themselves all the power of the violent elements that are about to throw their strength on this field. Critics compare this canvas with the painting by Shishkin I., which appeared several years earlier, but if Shishkin has rye in a state of stately and beautiful peace, Savrasov captured it at the moment of the greatest alarm that is transmitted to everyone who has ever seen this picture.